Comb the rooms of a gorgeous mansion to restore a garden to its former glory. "Bought it because my husband was bored with other games. He loves hidden object games. Now can't get him off this game, he loves it!" Comb the rooms of a gorgeous mansion for hidden items and restore a once stunning garden to its former glory. Choose from tons of garden accessories to customize the garden to your taste. Become part of the city's community and compete in the Best Garden contest. Don't worry if you are a garden design novice. An amusing and witty butler, Austin, will always be of assistance. Become an outdoor décor pro in this cutting hedge game. I'm so glad to be reunited with one of my favorite Hidden Object games. Naming the dog and interacting with Austin is hilarious! 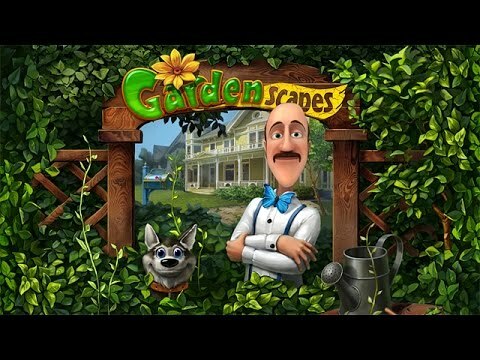 Have always enjoyed Gardenscapes series of games. I think the hidden object scenes help to keep your mind alert. I have enjoyed these games ever since Farmscapes came out. They truly help to keep your mind and memory sharp. Fun and wonderful way to relax! Enjoy interacting with the characters and playing the variety of games. I thought this game was a lot of fun. I played with my kids and they loved it as well. This is a really brilliant game from Playrix. I found it challenging, fun, and addictive. I replay the game often for relaxation. This game is a lot of fun. You will definitely enjoy playing it. Find hidden items to get money to customize and build a beautiful garden. Tons of fun. This is a cool game to unwind to. The graphics are pretty good as well. Some of the objects are hidden very well. I like this game because it helps me think. I am a senior and I hope it keeps my mind working.